Getting the right power mobility device at the right time can help you conserve energy, prevent falls and injuries, and remain more independent. These motorized scooters are similar to what you might see at the supermarket. They have a seat with armrests, a base for your feet, handlebars out front, forward/reverse directions, and speed controls. These basic power wheelchairs provide more support than scooters and are operated by a small joystick. 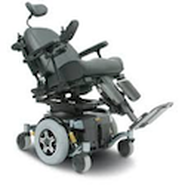 They have limited adjustment possibilities, few electronic features, and no ability to tilt or recline. These motorized, high-end wheelchairs (also called complex rehab or Level 3 power chairs) are custom fitted to support your body and postural needs. 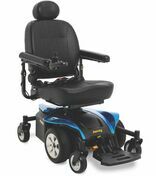 Their cutting-edge technology—including the tilt/recline feature, power leg rest, alternate driving modes and controls, and integrated Bluetooth® capabilities—can adapt to your evolving needs. You can choose to pay extra for a power-elevating seat. Portable respiratory and communication devices can be mounted or attached. How will I know what I need, and when? Always begin by consulting with your neurologist and ALS clinic team. They can help you determine which power mobility device is best for you—and when you should get it. The sooner you get the appropriate piece of equipment, the safer, more comfortable, and more independent you’ll be. ​If you need more than a walker or manual wheelchair, but are not yet ready for a big, custom power wheelchair, we recommend asking to borrow a power scooter or standard power wheelchair from your local ALS Association or MDA loan closet. ​Your Medicare health insurance will only cover one power mobility device every five or so years. So, instead of spending that benefit on a less expensive scooter or standard power chair, we strongly recommend using it on a custom tilt/recline power wheelchair, which typically costs over $20,000. Learn more about paying for your power wheelchair. ​Most ALS patients will eventually want the increased benefits and functionalities of a custom power wheelchair, which is the focus of this guide. Your doctor and ALS clinic team will let you know when they think you should begin the process of ordering your chair. Your ALS Guide and Quantum Rehab collaborated to develop the educational videos for Your ALS Power Wheelchair Guide. We would like to thank Quantum Rehab and Andrew Heitz for their time, feedback, and expertise. Andrew is an experienced Assistive Technology Professional (ATP) and Seating and Mobility Specialist (SMS) who has helped fit hundreds of ALS patients for custom power wheelchairs. Quantum Rehab is a leader in the development of cutting-edge custom power chairs. Please note that every wheelchair model will have different features and capabilities. The power-elevating seat shown in this guide, for example, is not typically covered by Medicare.